The Thirty Meter Telescope’s (TMT) primary mirror has much in common with the 10-meter mirrors on the Keck telescopes. They all have a segmented design and use edge sensors and actuators to keep the segments in perfect alignment (see Technology Corner). They also need to compensate for a host of environmental conditions that could affect the performance of the telescope. As the Keck telescopes operate, they are constantly jostled by things like wind, vibrations from machinery, and changes in temperature and humidity. All of these environmental conditions affect the ability of the telescope structure and control systems to maintain optical alignment and accurate telescope pointing. On the scale of the Keck telescopes, some of these factors are negligible while others can be easily corrected. However, environmental effects that don’t cause a problem for present-day telescopes can have very serious consequences for the larger telescopes like the TMT. For example, TMT scientists earlier discovered subtle effects of high humidity on the edge sensors for Keck’s mirror segments. When scaled up to the size of the TMT, these same conditions, if not addressed, would compromise the performance of the telescope. But, by understanding the problem in advance, the TMT’s mirror control system will be designed to compensate for humidity variations, avoiding a potentially serious problem. Also, small vibrations caused by pumps, compressors, and other machinery on or around telescopes could pose problems. Once again the Keck Observatory was used to help understand how the TMT would perform under similar circumstances. For the TMT, potential sources of vibrations were located away from the telescope and engineers developed other vibration dampening techniques. When combined, these measures will ensure that even though the TMT will be much larger than the Keck, its vibration environment will be lower and its ability to alleviate the effects of vibrations will be higher. These comparative investigations continue. Throughout 2010, a team of engineers has been measuring and monitoring a number of critical environmental conditions on the Keck telescopes. First, the team has been working to characterize the entire observatory environment, documenting all the possible internal and external forces and factors that could potentially impact telescope performance. Second, the TMT engineering team has been measuring the response of the telescope and its many control systems to all possible environmental disturbances. These measurements were made after installing wind and air temperature sensors on the telescope and at the top of one of the Keck domes. With data from these instruments, the team has been better able to characterize the environmental conditions around the telescope. This information was also used to estimate the atmospheric turbulence in the dome, which directly impacts the optical performance. The computer modeling tools being used to estimate the dome seeing at Keck are the same tools being applied to the TMT design. Measurements inside the Keck dome taken with an instrument called a laser scintillometer are also providing important tests for those turbulence estimates. The ultimate goal is to ensure that the TMT will deliver the best possible image quality. Additional research is now underway on the wind-induced motions of the Keck telescope and the ability of the control system to mitigate those motions, minimizing image jitters. 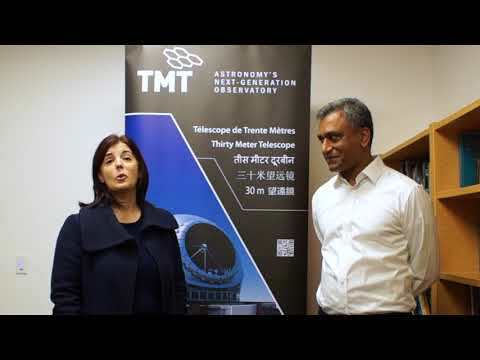 Critical elements of the TMT design are being supported by measurements made at operating telescopes that share many design and environmental aspects with TMT. The ultimate goal is to ensure that the TMT will deliver the best possible image quality while operating in the harsh environment of Mauna Kea.